Start with a quality “wow” item such as a stuffed animal, soccer ball with pump, or clothing outfit that will capture the child’s attention the instant he or she opens the box. 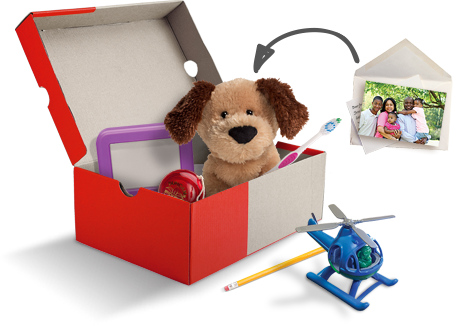 See our gift suggestions according to age and gender listed below for other fun toys, hygiene items, and school supplies to fill the shoebox. Candy; toothpaste; gum; used or damaged items; war-related items such as toy guns, knives, or military figures; chocolate or food; seeds; fruit rolls or other fruit snacks; drink mixes (powdered or liquid); liquids or lotions; medications or vitamins; breakable items such as snow globes or glass containers; aerosol cans. Make your own items such as hair bows, finger puppets, and friendship bracelets. Download instructions here. Make-it-yourself craft items or kit. Download instructions here. Make your own items such as finger puppets and friendship bracelets. Download instructions here. Make-it-yourself craft items or kit Download instructions here. You can Build a Shoebox Online in less than 5 minutes!